Did you know that it is possible to browse locally stored files in your Android phone using a browser that you have installed? Well this is a neat trick for you to view your files present in your SD card or your phone's internal memory. Your browser can be used to browse local files instead of the internet. It is possible to do the same with the help of file browser apps present at the Play Store. But using web browser apps to browse local files is much simpler and quicker for opening local files. You already have a web browser and you won't have to perform any additional app installation. You won't be able to perform other file related activities like renaming or moving files, for example. But for viewing and opening files, this method is quite useful. Using this method, you will also be able to open locally stored files such as pictures or html files with your browser. That means, you can open jpg, png, gif or even .html/.htm files with your Chrome browser. in the address bar of your browser. 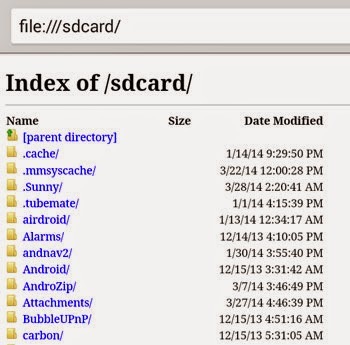 This will open the contents of your SD card using Chrome in Android. Then you can tap and click to navigate folders and open files as per your desire. Your file structure is displayed clearly in the browser itself. in the address bar of your Firefox browser and you will be displayed the entire directory and file structure of all the files present in your phone. Tap through those folders to navigate them. Click on the files to open them with the browser itself. to view the contents of your SD card. It should be noted that the file and folder structure can be slightly different in different handsets. Handsets with external storage slots might have a slightly different file structure that the ones without it. But if you just type file:/// you can view the entire structure and navigate through it perfectly.